From the silent shorts of the 1920s and '30s to the classic Disney features of the '40s, and from the Saturday morning television shows of the '70s and '80s to the computer-generated blockbusters of today, animation remains widely popular with viewers of all ages. With the current surge of interest in anime, the continued success of the Cartoon Network™, and the steady flow of animated movies, animation plays an important role in today’s pop culture. The Encyclopedia of Animated Cartoons, Third Edition remains the definitive source on this entertaining subject. This edition of the "ultimate cartoon fan bible" adds copious amounts of new material, bringing the book up to date and broadening the scope of its coverage. 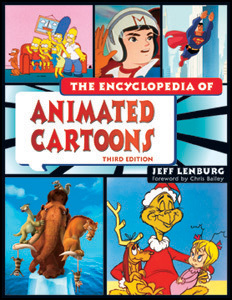 Arranged in an A-to-Z format and separated into five major sections—Silent Cartoon Series, Theatrical Sound Cartoon Series, Full-Length Animated Features, Television Cartoon Series, and Animated Television Specials—this comprehensive encyclopedia includes an extensive historical overview of animation, complete information about Academy and Emmy award winners, and a chronology of animation milestones. Coverage of increasingly popular anime has been added and expanded. "...[an] exhaustive work...impressive. The one reference source that no library should be without." "...the breadth and depth are impressively exhaustive...should be included in all collections supporting research in animation, film, American studies, art, and history. Highly recommended." "...the most comprehensive book on American cartoon history...recommended for all libraries." "Any library strong in animated cartoon coverage will find [this encyclopedia] a weighty, definitive reference." "...coverage is thorough and comprehensive...appeals to readers because it is not only useful in finding elusive facts, it also offers the enjoyment of browsing that sparks new discoveries." "...an excellent guide to the history of animated cartoons in America."